Evernote for Windows Phone 7 lets you capture your ideas, experiences, and inspirations as they happen, wherever you find yourself. Then easily search and find all your notes, even those created using Evernote on your desktop. Capture everything.Chances are, if you can see it or think of it, Evernote for Windows Phone 7 can help you remember it. 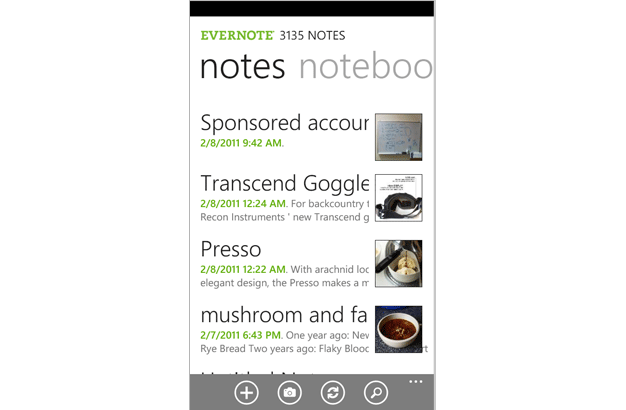 Evernote for Windows Phone 7 turns your phone into an extension of your brain. Evernote for Windows Phone 7 makes it easy to remember things big and small from your notable life using your computer, phone, and the web. Get started today with a free account. Capture everything.Chances are, if you can see it or think of it, Evernote for Windows Phone 7 can help you remember it. Type a text note. Clip a web page. Snap a photo. Grab a screenshot. Evernote for Windows Phone 7 will keep it all safe. Organize it. (Or let us do it. )Everything you capture is automatically processed, indexed, and made searchable. If you like, you can add tags or organize notes into different notebooks. Find anything fast.Search for notes by keywords, titles, and tags. Evernote for Windows Phone 7 magically makes printed and handwritten text inside your images searchable, too. Qweas is providing links to Evernote for Windows Phone 7 2.2.0.0 as a courtesy, and makes no representations regarding Evernote for Windows Phone 7 or any other applications or any information related thereto. Any questions, complaints or claims regarding this application Evernote for Windows Phone 7 2.2.0.0 must be directed to the appropriate software vendor. You may click the publisher link of Evernote for Windows Phone 7 on the top of this page to get more details about the vendor.